Another lucky haul from my local secondhand store’s anime shelf, Princess Arete is a relatively obscure anime movie I knew next to nothing about before I claimed the pretty limited edition box as my own. It has a good pedigree as a production of Studio 4°C (Memories, Mind Game, Tekkonkinkreet and Berserk - The Golden Age Arc) and as the directorial debut of Sunao Katabuchi (Black Lagoon, Mai Mai Miracle, In this Corner of the World). Although it was the limited edition package I obtained, there are very little in the way of extras with this release. The minimalist design of the shiny cardboard box is attractive, inside are 4 postcards plus a DVD and Blu-ray copy of the movie. The discs themselves are bare-bones with nothing other than the movies and minimal audio/subtitle options. Not even a trailer to put the movie in context. What the packaging fails to mention is that this is a production from 2001, and therefore it looks a little dated in comparison to more modern digital anime movies. It has a muted hand-drawn medieval aesthetic not dissimilar to mid-period Disney (Robin Hood, The Sword in the Stone), though thankfully doesn’t exhibit the same scratchy xeroxed-look as those 1960s/70s films. Character designs are simple and timeless, and certainly don’t scream “anime” at all - if anything, this could be mistaken for a european animation. Our main character Princess Arete wouldn’t look out of place in the films of Michel Ocelot (Kirikou and the Sorceress, Azur & Azmar). Probably the least “anime” anime princess ever. The box does mention that the movie is based on Diana Coles’ story The Clever Princess (published 1983, Sheba Feminist Publrs). Ms Coles does not appear to have written any other books and her story was originally published as a feminist deconstruction of the patriarchal passive princess archetype so common in European fairy tales. Although the story seems to have disappeared into obscurity in the west, feminists in Japan latched onto it and it became widely read and appreciated to the point that this movie was produced. Feminist themes are evident from the outset - the young Princess Arete is imprisoned in the upper tower of her father the King’s castle, in order for him to marry her off to the one adventurer who brings him the most valuable magical trinkets. Arete twigs that she’s being used merely as an excuse for the King to gain more power, and the hapless men who he sends to do his bidding are similarly exploited. The men in her story - at least to begin with - are portrayed as either cold and distant (the king), boorish and misguided (Prince Dullabore - what a great name!) or as insincere liars (her unnamed second suitor). Her later encounter with the Wizard Boax is similarly negative, though his character arc is more complex with a hint of redemption towards the end of the story. Arete - literally and figuratively caged. Arete herself is unsatisfied with her life in a gilded cage and longs to make something worthwhile with the labour of her own hands. In a world where sorcery has long since faded, she recognises that people with freedom to exercise their own will, to learn skills of their own create a different - and lasting kind of magic. With only her beloved books to inform her of the outside world, she lacks the ability to learn practical skills unlike the town’s children she wistfully spies on from her distant window. 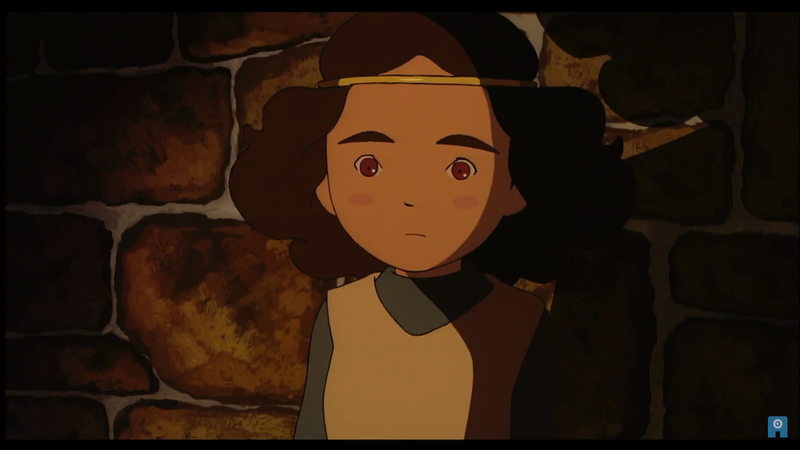 In one early scene, she escapes her tower through a secret passage and enquires about learning a cloth-making trade. She’s told in no uncertain terms that the tradesmen’s guild prohibits passing skills onto girls. Even out-with her castle, she is frustrated by the role society forces on her. Never trust shifty wizard dudes with facial scars. As a final indignity, the Wizard Boax tricks the King into marrying off his wayward, unprincess-like rebellious daughter to him by casting a spell on her to make her lose her independent will and become every bit the stereotypical passive princess. Boax then spirits her away in his Da-Vinci-esque flying machine only to imprison her in a deeper dungeon, for he has only need of her for his own nefarious plans, not for any value inherent to her as a person. Although this section is absolutely central to the plot and themes of the movie, it’s unfortunate that it is also the point that any forwards momentum of the plot grinds to a halt. Arete spends a great deal of the film as an agency-less cipher unable to even comprehend her plight. In a way this is a horrifying situation, but the execution lacks any kind of drama. This film that was languidly paced during its first segment then utterly stagnates to the point I found myself almost dropping off. Only once Arete finally asserts her own independence and agency does the plot spark once again into life and thankfully the end sequence of the film is far more entertaining as she saves not only herself but the peripheral characters and even her antagonist. By exercising her intelligence and empathy she seizes her destiny on her own terms and the grey, dead world around her is enhanced and redeemed. A quite spectacular finale with a monstrous golem-like statue is one of the very few concessions to typical anime-style tropes, along with a beautifully rendered sequence of a parched land returning to life through an almost apocalyptic deluge of water. Random, slightly out-of-place stone Kaiju - I guess this is anime, after all. Although this is very much a children’s movie with a simple plot, the themes of personal growth, individualism and release from oppression should resonate with most thinking adults. Some of the film’s imagery is striking - a shining mechanical bird reminiscent of the Mysterious Cities of Gold makes a blink-and-you’ll-miss-it cameo, and that’s not the only thing reminiscent of that old Japanese-French co-production. A subplot about an ancient technologically advanced civilisation that perished to some awful cataclysm is peppered throughout the movie, really it adds only a little extra flavour, though it does provide an explanation for the antagonist’s actions. In a way I wish this could have been explored in more detail, though perhaps that would have muddied the simple story. Where’s Esteban, Zia and Tao when you need them? A fascinating glimpse of the lost past - I’m sure this is a homage to Bruegel’s tower of Babel paintings. Overall, I don’t think this is a movie I’d willingly sit through again. It could easily have 20-30 minutes removed and it would still tell the same story effectively but more economically. As a piece of animation history it was interesting, and it did give me something to think about. Those with patience for slow but pretty movies should check it out if and when it comes out in theaters this autumn. This limited edition set does not appear to be freely available any longer, however there are standard editions sets still for sale for Region B Blu-ray/Region 2 DVD.